Many of the large birds that live in Florida year-round have exceptionally long necks and legs for wading in the swampy terrain, while others have expansive wingspans for coasting high above the water to find fish. Birds are known to migrate to the state seasonally and inspired the term “snow-birds,” used to describe the annual residents of Florida during the winter months. 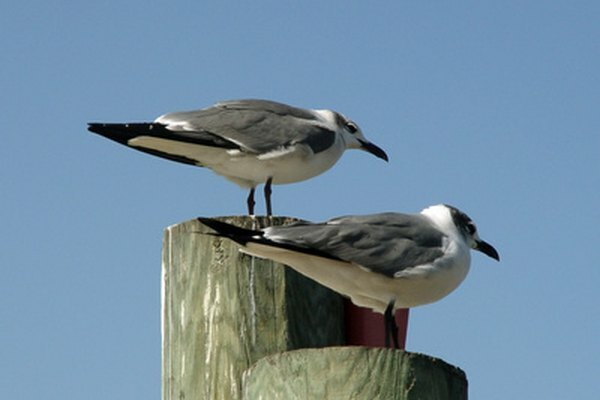 A surprising number of Florida birds are white; however, most can be easily identified by their bill or head-markings. 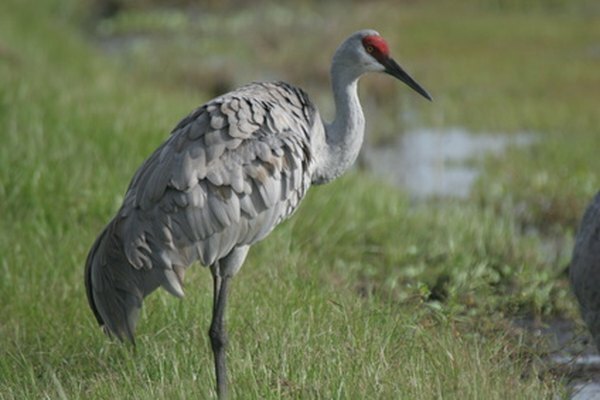 Two common species of crane live in Florida: the white whooping crane (Grus Americana) and the brown sandhill crane (Grus canadensis). Both have a characteristic bright red forehead, pointed bills and fluffy, protruding rumps like an ostrich. The whooping crane, the tallest bird in the United States at 5 ft., is highly endangered. 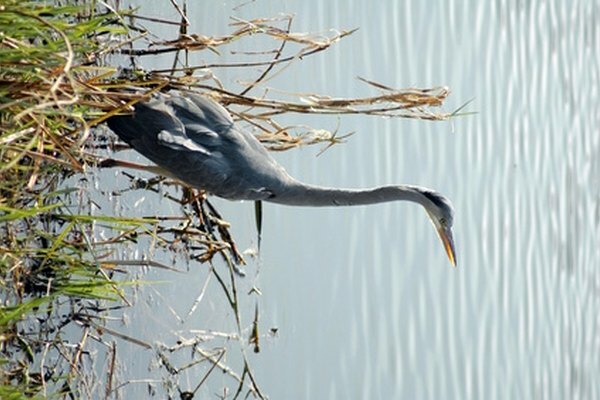 The sandhill crane stands just under 4 ft.
Another common bird group in Florida is the herons, with the most noticeable being the great blue heron (Ardea herodias). These grayish-blue birds stand 3 to 4.5 feet tall and have a wingspan of 5.5 to 6.5 ft. The adult little blue heron (Egretta caerulea) is a much darker blue than its great cousin and stands half as tall. 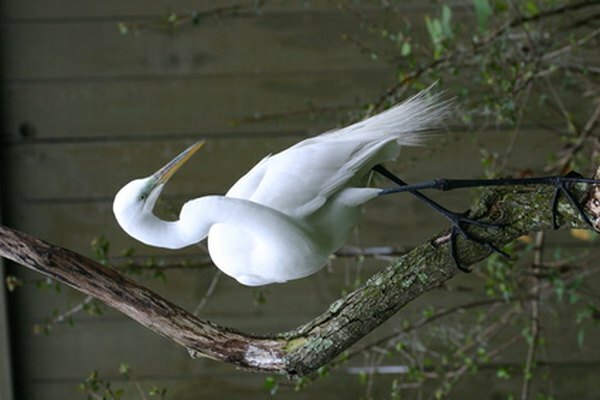 The great egret is a type of heron, with the characteristic long neck and legs. It is a common species in North America that has all white feathers and a relatively short, sharply pointed yellow bill. The bird stands 3 ft. tall and has a wingspan of 4.5 ft. The tail feathers of a great egret appear shredded. 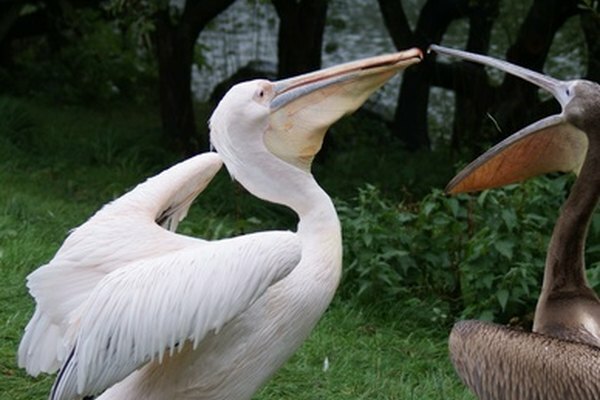 Pelicans have thick beaks with bottom flaps that expand to hold water. These birds are frequently spotted flying in formations along Florida coasts. The bird is stout and stands 3 to 4 ft. tall with a noticeably pronounced wingspan of 6.5 ft. The white pelican (Pelecanus erythrorhynchos) is an inland freshwater bird, unlike brown pelicans (Pelecanus occidentalis), which prefer the ocean. Pelicans dive head-first into the water to scoop out fish. This endangered species has white body feathers and a black leathery head with matching legs. The head and upper neck are bald. In flight, a thick line of black feathers can be seen on the underside of the wings. 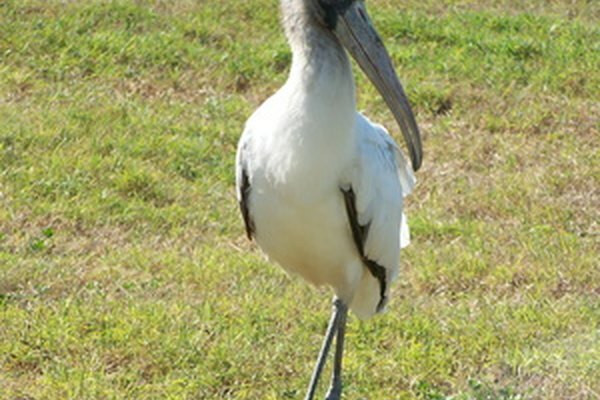 The wood stork stands 2 to 4 ft. tall has a wingspan between 5 and 6 ft. 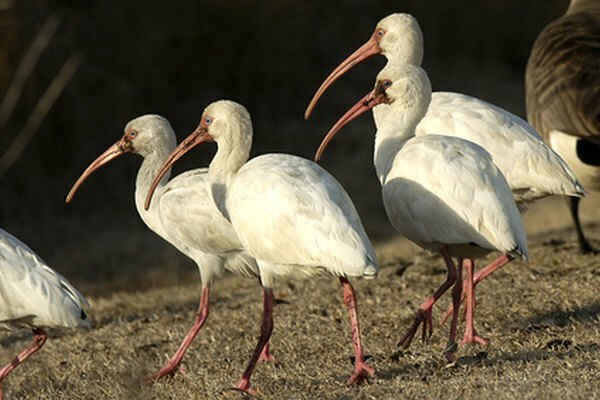 The white ibis (Eudocimus albus) is a small white freshwater bird often seen walking through Florida neighborhoods in a flock of five to ten. The ibis stands about a foot tall and has a thin pink beak nearly as long as it’s body, which it uses to pick food from the ground. Another common ibis is the glossy ibis (Plegadis falcinellus), which has the long, slightly-curved ibis bill and a burgundy head and neck with a shiny dark blue body. 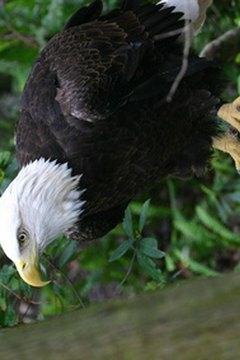 Many species of ducks, geese and hawks are native to Florida or visit during the winter. Sea gulls are especially common in Florida, along with sea hawks, both of which live on the coasts. Large black vultures are often seen along the highways removing road kill. Tall pink flamingos and the albatross can be found in some areas of southern Florida.